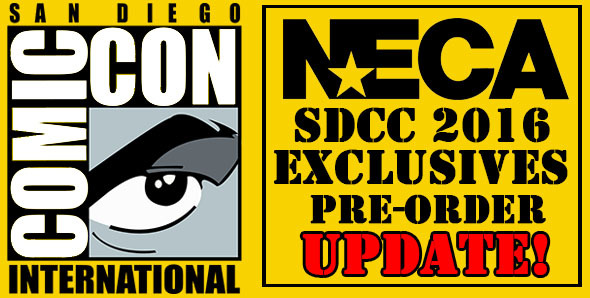 You are here: NECAOnline.com » Licenses » Movies » Alien » SDCC 2016 Exclusives: Pre-Orders Almost Full! If you haven’t pre-ordered your SDCC exclusives yet, do it now! The inventory allocated for pre-orders is almost gone – we expect to close pre-orders at the end of the holiday weekend. Click here to visit The NECA Store and place your pre-order. This year’s exclusives will not be available in stores or online at any point. You can only pick them up at SDCC. It’s worth it to read the FULL PRE-ORDER FAQ. –>PRE-ORDERS ARE FOR PICKUP AT SDCC 2016 ONLY. NO SHIPPING. –>MUST SHOW ORDER #, VALID ID & BADGE (NO EXHIBITOR BADGES). –>NAME ON ORDER, ID AND BADGE MUST MATCH. Come visit us in booth #3145 at SDCC!